Composition: 25% Polyamide /75% Cotton warp & weft. Raised on both the sides, this quality is used mainly for decatising the highest quality fine worsted, and carded woollen or wool-synthetic goods. This quality produces a dull, soft finish with no lustre under standard wrapper tension. 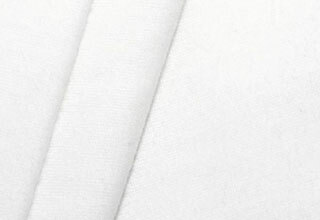 The fine satin base prevents weave structure marking off when processing light weight fabrics (<300gsm) that are too fine for the use of a Molleton wrapper. Low wrapper tension and a lower temperature can be used to create a dull and soft finish, whilst higher wrapper tension with moderate temperature can create a harder but still dull finish.